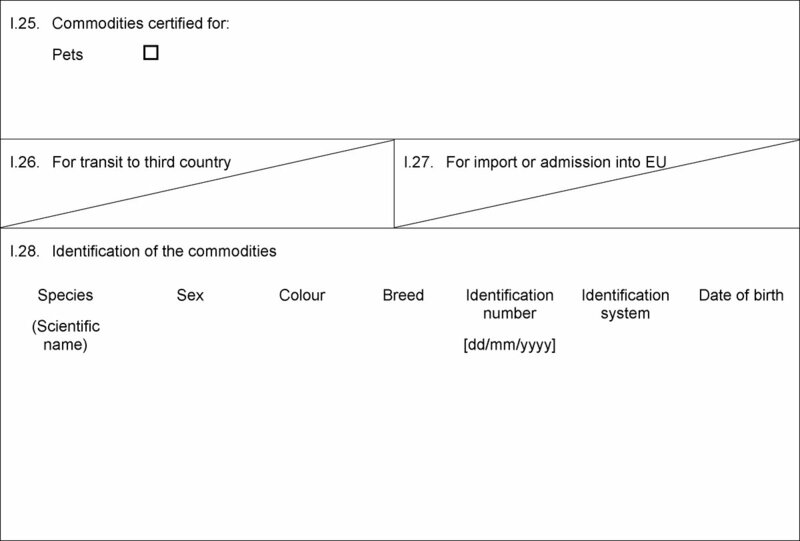 Regulation (EU) No 576/2013 provides that dogs, cats and ferrets moved into a Member State from a territory or a third country for non-commercial purposes are to be accompanied by an identification document in the format of an animal health certificate. Part 1 of Annex IV to Commission Implementing Regulation (EU) No 577/2013 (2) sets out the model for the animal health certificate. 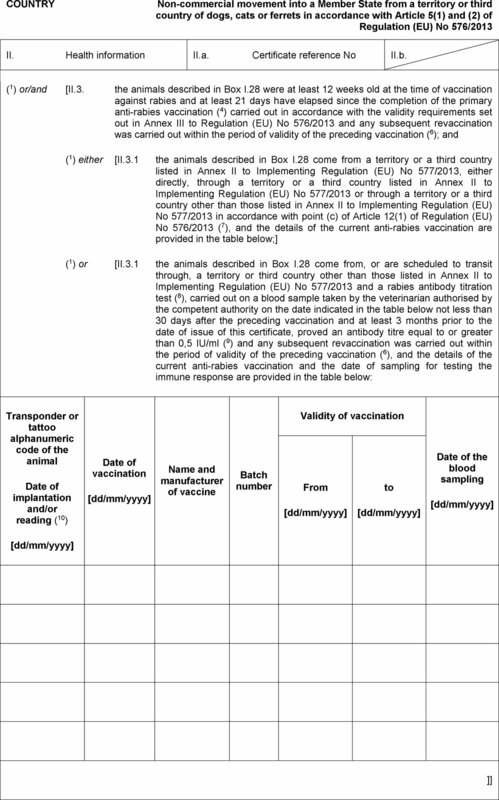 In the model of animal health certificate reference is made to the required successful test for immune response to anti-rabies vaccination that should be performed in accordance with Annex IV to Regulation (EU) No 576/2013 on blood samples taken from dogs, cats and ferrets coming from or scheduling to transit through a territory or a third country other than those listed in Annex II to Implementing Regulation (EU) No 577/2013. Following the repeated forgery of laboratory reports on the results of the rabies antibody titration test, it is appropriate to remind the certifying officials in territories or third countries that the satisfactory results to that test should not be certified unless the authenticity of the laboratory report has been verified. A specific guidance note to that effect should be included in the animal health certificate. Furthermore, the entry regarding the date of marking of dogs, cats or ferrets in Part I of the animal health certificate has been misinterpreted by certifying officials in third countries and has therefore caused problems during compliance checks at Union external borders. In order to avoid any misunderstanding, that entry should be removed from Part I of the animal health certificate that describes the animals, and inserted in Part II of that certificate, that concerns the certification of the animals. A specific note for guidance concerning the verification of the marking should also be included in Part II. Annex IV to Implementing Regulation (EU) No 577/2013 should therefore be amended accordingly. To avoid any disruption of movements, the use of animal health certificates issued in accordance with Part 1 of Annex IV to Implementing Regulation (EU) No 577/2013 before the date of application of this Regulation should be authorised during a transitional period. Annex IV to Implementing Regulation (EU) No 577/2013 is amended in accordance with the Annex to this Regulation. 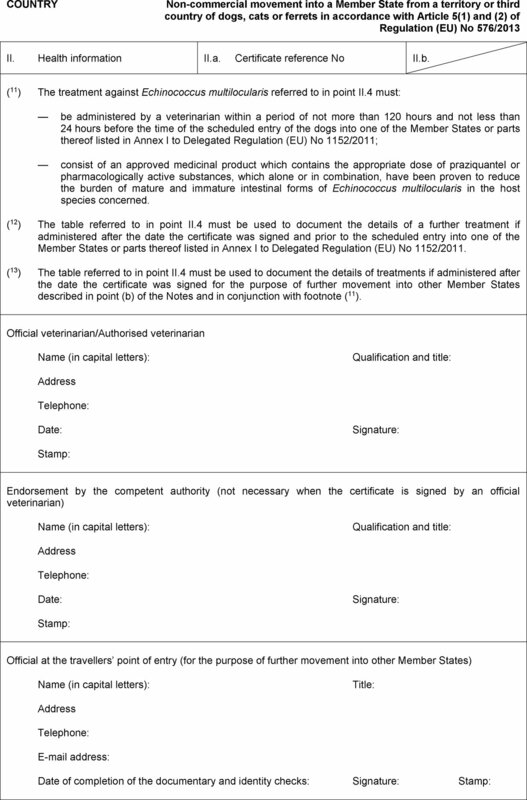 For a transitional period until 31 December 2016, Member States may authorise the entry of dogs, cats and ferrets moved into a Member State from a territory or a third country for non-commercial purposes and accompanied by an animal health certificate issued not later than 31 August 2016 in accordance with the model set out in Part 1 of Annex IV to Implementing Regulation (EU) No 577/2013 in its version prior to the amendments introduced by this Regulation. It shall apply from 1 September 2016. (1) OJ L 178, 28.6.2013, p. 1. (2) Commission Implementing Regulation (EU) No 577/2013 of 28 June 2013 on the model identification documents for the non-commercial movement of dogs, cats and ferrets, the establishment of lists of territories and third countries and the format, layout and language requirements of the declarations attesting compliance with certain conditions provided for in Regulation (EU) No 576/2013 of the European Parliament and of the Council (OJ L 178, 28.6.2013, p. 109). (a) This certificate is meant for dogs (Canis lupus familiaris), cats (Felis silvestris catus) and ferrets (Mustela putorius furo). (b) This certificate is valid for 10 days from the date of issue by the official veterinarian until the date of the documentary and identity checks at the designated Union travellers’ point of entry (available at http://ec.europa.eu/food/animal/liveanimals/pets/pointsentry_en.htm). In the case of transport by sea, that period of 10 days is extended by an additional period corresponding to the duration of the journey by sea. Box I.5: Consignee: indicate Member State of first destination. Box I.28: Identification system: select of the following: transponder or tattoo. Identification number: indicate the transponder or tattoo alphanumeric code. Date of birth/breed: as stated by the owner. (2) The declaration referred to in point II.1 shall be attached to the certificate and comply with the model and additional requirements set out in Part 3 of Annex IV to Implementing Regulation (EU) No 577/2013. (3) The evidence referred to in point II.1 (e.g. boarding pass, flight ticket) and in point II.2 (e.g. receipt of entry to the event, proof of membership) shall be surrendered on request by the competent authorities responsible for the checks referred to in point (b) of the Notes. (4) Any revaccination must be considered a primary vaccination if it was not carried out within the period of validity of a previous vaccination. 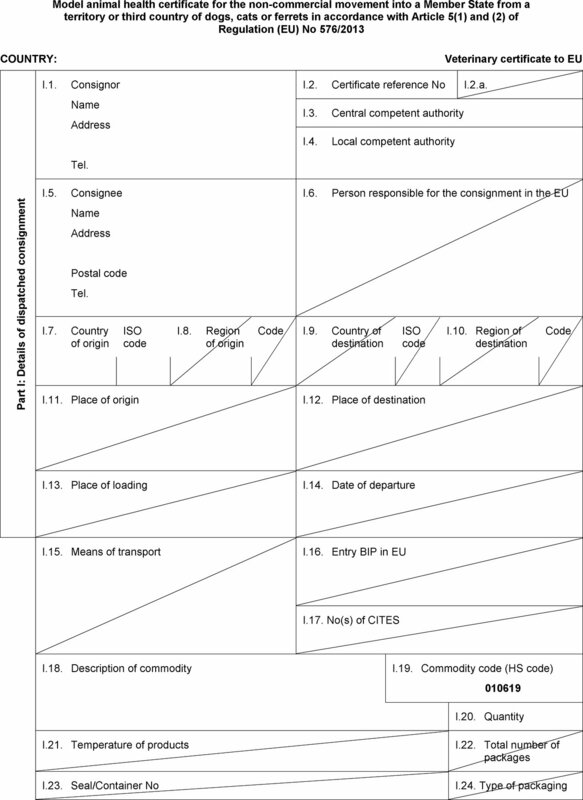 (5) The declaration referred to in point II.3.2 to be attached to the certificate complies with the format, layout and language requirements laid down in Parts 1 and 3 of Annex I to Implementing Regulation (EU) No 577/2013. (6) A certified copy of the identification and vaccination details of the animals concerned shall be attached to the certificate. 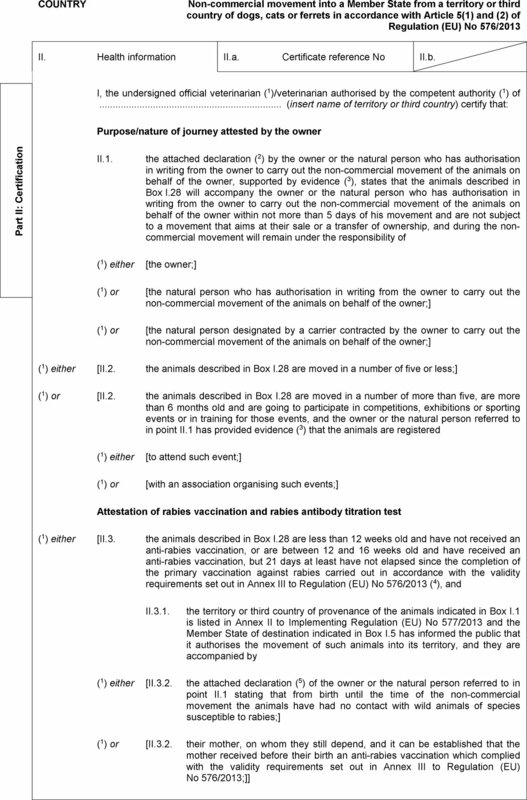 (7) The third option is subject to the condition that the owner or the natural person referred to in point II.1 provides, on request by the competent authorities responsible for the checks referred to in point (b), a declaration stating that the animals have had no contact with animals of species susceptible of rabies and remain secure within the means of transport or the perimeter of an international airport during the transit through a territory or a third country other than those listed in Annex II to Implementing Regulation (EU) No 577/2013. This declaration shall comply with the format, layout and language requirements set out in Parts 2 and 3 of Annex I to Implementing Regulation (EU) No 577/2013. — does not have to be renewed on an animal, which following that test with satisfactory results, has been revaccinated against rabies within the period of validity of a previous vaccination. A certified copy of the official report from the approved laboratory on the results of the rabies antibody test referred to in point II.3.1 shall be attached to the certificate. (9) By certifying this result, the official veterinarian confirms that he has verified, to the best of his ability and where necessary with contacts with the laboratory indicated in the report, the authenticity of the laboratory report on the results of the antibody titration test referred to in point II.3.1. 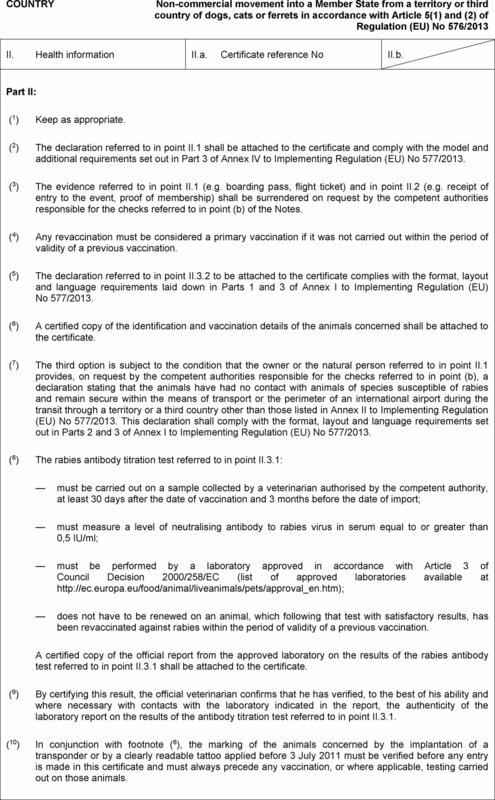 (10) In conjunction with footnote (6), the marking of the animals concerned by the implantation of a transponder or by a clearly readable tattoo applied before 3 July 2011 must be verified before any entry is made in this certificate and must always precede any vaccination, or where applicable, testing carried out on those animals. — consist of an approved medicinal product which contains the appropriate dose of praziquantel or pharmacologically active substances, which alone or in combination, have been proven to reduce the burden of mature and immature intestinal forms of Echinococcus multilocularis in the host species concerned. 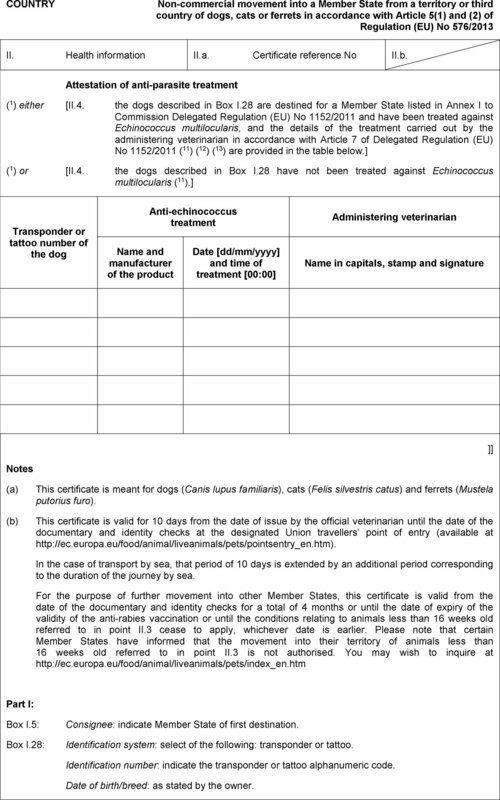 (12) The table referred to in point II.4 must be used to document the details of a further treatment if administered after the date the certificate was signed and prior to the scheduled entry into one of the Member States or parts thereof listed in Annex I to Delegated Regulation (EU) No 1152/2011. (13) The table referred to in point II.4 must be used to document the details of treatments if administered after the date the certificate was signed for the purpose of further movement into other Member States described in point (b) of the Notes and in conjunction with footnote (11).